Question: Do people have any choice left once they’ve heard the explanation of the laws of the integral world? Answer: No, because these laws do not depend on us. Imagine a fictional scenario where an alien ship is approaching us and is warning us in advance that by the time it reaches us, we have to reach mutual guarantee. And whoever does not is “doomed.” That is exactly how the laws of nature operate: They suddenly become revealed to us and force us to become aware of what is happening. Nature’s condition is invariable. We have reached the phase of the single system, whose law is the interconnection of all the parts. This is the mutual guarantee, or in other words, mutual support, the proper participation in the common life, mutual understanding and respect, friendship. You can put it any way you like. Say it warmly and pleasantly, but don’t forget to inform people of the fact that this is an invariable law and there is nowhere to run from it. Today and tomorrow depend on our explanations. The need for mutual guarantee will not disappear. It will only increase from one day to the next and will require us to realize it. The common system will become increasingly more closed and fused together, the interconnection will become tighter, and the transfer of information via communication lines between us will gain more power, pressure, and intensity. We will become more aware of these processes and whoever understands and recognizes them will come out on top. In any part of the word, in any society, in manufacturing and trade, in children’s upbringing, and in any other area, success will come to those who are able to use this integral system correctly, who become integral on the inside. These people will gain the right approach and the right calculation, will draw up agreements the right way, and will succeed in everything by virtue of having an inner copy or mold of the external system. Today we lack this correspondence, which is why we are in crisis: I am an egoist on the inside, while the system is already being revealed to me as united, as all-inclusive. As a result, I cannot treat anyone or anything correctly. Thus, nature places us before an inevitable necessity. However, when we explain it to people, it is nevertheless better to soften this harsh message. Our task is not to take a person’s freedom away or to tie his hands, but to wrap him in warmth despite the inevitable changes. The process changes fundamentally if we bring ourselves into similarity with the system. Imagine that the nation tries to attain mutual guarantee, mutual empathy. This will give us an enormous desire to help people. They are like children, and even though their pleas are not turned to us, we will be imbued by their desire, which we won’t be able to satisfy. It will tear us apart on the inside like birth pangs, and that is how we will evoke a tremendous force in order to conduct it to others. And then, the Creator will become revealed—for us and for them. It doesn’t matter that they still don’t feel that this is Him. At the initial stages, this does not appear as the upper force but as an understanding of things and forces that operate in the world, the expression of the universal interconnection and mutual interaction. The air will suddenly become thicker and a person will acquire the general understanding, a common sensation together with others, unity without words. And that is already a revelation because a person acquires a new mind, a new feeling. He opens up a new perception and suddenly notices things that did not exist for him before. We are standing at the threshold, and this is a very exciting period. I am very anxious because this has never before happened in history, but today we are being obligated to do it. I am waiting for you to finally attain what you desire. This is a chance for the whole world: Today we can already accelerate and reduce the entire process. Let us hope that we will achieve success. Until this time we did not advance by our own mind or our own correct decisions, but with the help of the upper force. And still, we have been brought to this. And that is very important. Question: In our world it is customary to lower yourself before a person you deem important. Why is it so difficult to lower yourself in the spiritual world? Answer: In our world we lower ourselves before an important person because by doing so, we profit. Our egoism always carries out actions that are profitable for it. If a person is influential, powerful, and wealthy, then it’s worthwhile for me to lower myself before him and to be next to him, to serve him, because I know that usually a small person receives from a big one, and I expect to receive something as well. That is how we usually act in this world. And if we don’t act that way, then we receive blows that make us learn this principle. Suppose I don’t want to listen to what a policeman says to me. Then I receive a fine or get called to court where I receive a punishment. So next time I will listen. That is, in our world it is egoistically profitable to listen to a powerful person, and if I don’t understand this, then life will teach me with blows. However, this does not work in relation to the Creator because He is concealed! After all, if His quality of bestowal became revealed to you, then you would run after Him like a thief who runs ahead of the crowd, yelling, “Catch the thief!” It would seem that you love the Creator from the bottom of your heart because you can receive so much from Him. Who wouldn’t want to cleave to this force, which controls the whole world? It’s clear that this is what every person does. That is why the Creator cannot become revealed to us as great, mighty, and generous. He can only become revealed as an example of the quality of bestowal, which we have to acquire on our own. But then you won’t want Him and will run away from Him. That is why He cannot become revealed to you—not from the good side nor from the bad, not from the side of fulfillment, nor from the side of intention. The only thing that remains for us is to work with the environment. The Creator gives us a small desire for bestowal, but everything else has to be revealed by us in the environment that inspires us to bestow, to build our desire for the upper force. We receive help and awakening from above only to the extent of our exertion in the studies, the environment, and dissemination. It’s impossible to advance in any other way. Otherwise we would chase Him, wishing to swallow Him up, or would run away from His quality of bestowal, being scared of the possibility of becoming that way ourselves. In the News (From France24.com): “Flooding, drought, and superstorms boosted by climate change are not only poised to ravage human habitats but mental health as well, according to Australian researchers. “Up to now, however, few efforts have been made to assess the psychological impact of climate change-enhanced weather events, which in Australia have destroyed communities, farms, and businesses. “In poorer countries with less capacity to absorb such shocks, the consequences on mental health are likely to be even greater, the report warned. “’The emerging burden of climate-related impacts on community morale and mental health – bereavement, depression, post-event stress disorders, and the tragedy of self-harm – is large,’ noted Tony McMichael, a professor at Australian National University, in introducing the study. “Statistics from Australia show higher rates of drug and alcohol abuse, violence, family breakups, and suicide after extreme weather events, with impacts more pronounced in rural and semi-rural areas according to the report. “’Evidence is emerging that drought and heat waves lead to rates of self-harm and suicide as much as eight percent higher’ when annual rainfall is at least 300 millimetres below average, it said. “Children in particular are vulnerable to pre-disaster anxiety and post-trauma illness, the researchers noted. “This is due not only to direct exposure of life-threatening situations and dislocation from family and community supports, but also to ‘the reality of living with long term threat,’ noted Ian Hickie, director of the Brain and Mind Research Institute. My Comment: But namely man by his behavior, his lack of aspiration to balance with nature causes the changes of nature, its instability and variability. And then nature itself reacts to these changes and backlashes. It’s because nature consists of the following parts: still, vegetative, animate, and human. A human is the highest part of nature, not because of his animal body, but due to his desire and reason. For thousands of years, nature was developing desires and reason in humans. While the desires and the mind were evolving, nature did not put obstacles for us. But at the end of the last century, the individual development in each person came to an end. Since then, the desire and the mind started to unite with nature in one integral network. The world became globally and integrally connected. The network between us made us interconnected. However, the desires and the mind remained egoistic, and thus, are opposite to the network, and in the process of convergence, evoke greater hatred and crisis: Egoists cannot function in the common network. And because man’s desire and mind are the highest, that is, the most influential in the connection network between all parts of nature, people suffer more than others—and from all other levels. It is the time for everyone to draw a conclusion because nature will force us anyway! Is it not better to change our inner nature: egoism? “Spain’s Socialist government is considering an increase in capital-gains tax as a result of the economic crisis but will not raise tax rates on earned income, José Luis Rodríguez Zapatero, prime minister, said on Monday. “In Italy too, one of the country’s richest citizens has come forward to offer to pay more tax…. “Luca di Montezemolo, the multimillionaire Ferrari chairman, made his offer in an interview with the centre-left daily La Repubblica earlier this month. My Comment: No transfer of money between various parts of society will help. Undoubtedly, it is necessary to eradicate beggary, poverty, to bring everybody to the level of normal existence. But beyond that, the problem cannot be solved by monetary injections! People do not realize exactly what they want. Everybody feels the problem of existence in the world that has become unmanageable. But no one sees how to solve this problem because its solution is not at the level of our egoistic desires and thoughts, where we used to solve our life problems. Rather, it is in the ascent above them to the sphere of altruistic relationships. People still cannot accept the fact that we deal with nature that develops us according to its plan. They consider themselves above it, although everything that is in us has been created by nature, and it is above us. The reason for this attitude towards nature is that the upper forces of nature are hidden from man, hidden namely because of their perfection, but it seems to man that they simply do not exist, and he is the only master in the world. That is why he has become accustomed throughout history to do whatever he pleased in the world: Everything is permissible, there is no responsibility, and no one demands accountability. But this time has passed like a carefree childhood. Adult life begins, obliging us to pay for everything, even for the unrealized desires and thoughts. Nature takes into account people’s desires and thoughts. The egoistic ones, to the detriment of others, cause negative consequences, and vice versa, the good ones bring positive results. Sure, this looks like mysticism and religion, but we will have to think, scrutinize, and discover that we are surrounded by the force of nature, which we have to consider and try to be in balance with as we are familiar with and take into account its particular forces of gravity, electricity, or magnetism. A violation of the laws of nature brings the violator suffering. As we develop, we are obliged to observe, as growing people, more and more laws. Today, we are required to fulfill the law of balance with nature, not by each of us, but by society as a whole so that the entire humanity takes the form of a unified whole in its mutual connection (mutual guarantee) and thus becomes equal to the general law of nature—to maintain harmony in all parts of this single organism. Solution: The rich should set aside funds for the education of society in mutual guarantee and the explanation of the new laws of the world, global and integral ones. This will provide an opportunity to redistribute wealth and excess so as to achieve material balance and spiritual harmony. Question: How can we explain to people the true meaning of social justice? Answer: Along with the external demands, people feel deep inside the bitterness of inequality, of social and national injustice, of various differences. A person values himself not for who he is, but in comparison with others. Never before have we lived as well as today, but when we look at each other, we feel bad. Of course, there are people who truly live “from paycheck to paycheck,” and their living standards should be immediately raised to the minimal level. However, all the other imbalances need to be fulfilled primarily by way of mutual unification. No “just distribution” will help here: It will only aggravate conflicts. Any addition to someone would raise rumors and criticism, discontent and resentment. Try to increase salaries in one of the sectors, and it will be hated. Even if this is not done at my expense, and even if I am not supposed to get more, I am still wondering why the money was given to them and not to me. In what case will I be happy for a person who was given a raise? Only if I am connected to him by the ties of love. So, first, I should be taught the right attitude so that I consider him. For starters, before we even reach mutual guarantee, we need to understand that we completely depend on each other. 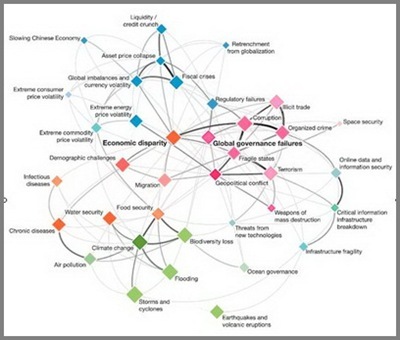 Report: Global Risks 2011. The Risks Interconnection Map illustrates the interconnections between the following factors: liquidity/credit crunch, slowing Chinese economy, retrenchment from globalization, global imbalances and currency volatility, asset price collapse, extreme commodity price volatility, extreme energy price volatility, fiscal crisis, extreme consumer price volatility, regulatory failures, illicit trade, corruption, organized crime, fragile states, terrorism, geopolitical conflict, global governance failure, weapons of mass destruction, space security, online data information security, critical information infrastructure breakdown, treats from new technology, infrastructure fragility, economic disparity, demographic challenges, migration, food security, water security, infectious diseases, chronic diseases, climate changes, biodiversity loss, air pollution, flooding, storms and cyclones, ocean governance, and earthquakes and volcanic eruptions. In the News (From rt.com): “Belarusian president Aleksandr Lukashenko has called on his political opponents, the European Union, and Russia to sit down for a round-table discussion about the current situation in his country and its future. My Comment: The key is to begin correctly and then stay on course: to discuss openly based on the actual laws of nature, which dictate the necessity to reach consent and mutual guarantee. As soon as we advance at least a bit in this direction, the country and society will prosper according to the similarity with Nature. Is It So Easy To Exit The Crisis?